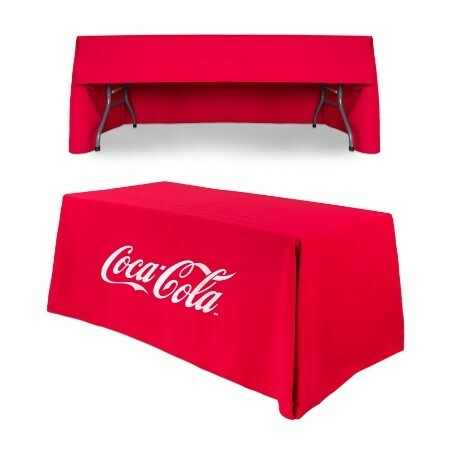 Why Choose a Fully Printed Promotional Tablecloth? We offer a wide range of Printed Tablecloths and our all over print table cloths are an ideal way to promote your brand. A table cloth is a versatile marketing solution ideal for all sorts of exhibitions and events. Price Drop – we have just slashed our prices on our branded tablecloths with full print. The 5ft tablecloth was £141 and is now £119; 6ft tablecloth is reduced from £166 to £139 and the fully printed table runner was £60 and is now just £49. There is no better, inexpensive way to improve your exhibition stand than with a professional, quality table cloth covered with your artwork to showcase your brand. Any Design – full print means just that, full print – the custom table cloth is printed all over with your artwork, image or design. This means you have unlimited design potential – the only restriction is the size of the cloth! You can print one large image, have a design all over or have a step-repeat pattern of your logo. Quality – the cloth is made from 205gsm polyester fabric with a satin finish. The edges are hemmed and overlocked for a neat, professional finish. Artwork is printed in full colour to a high standard. The cloth is dye-sublimation printed, a process where heat and pressure are used to transfer dye onto fabric resulting in permanent, high resolution print which will not crack, fade or peel. Easy to Maintain – our fully printed tablecloths are easy to maintain. They can be machine washed on a cool 30oc cycle and ironed on a low heat so are easy to keep in mint condition. They are not suitable to be tumble dried so leave to dry naturally. Versatile – a branded table cloth can be used for almost any type of exhibition or display event. From trade shows to conferences, sports events to motor shows, craft fairs to community events, a tablecloth fully printed with your brand will add the finishing touch to your display stand. For very little cost a promotional tablecloth will make a big difference to the look of your stand. Graphic Design Service Available – no artwork? No problem! We have an in-house graphic design team and one of our talented designers can create a design for your exhibition tablecloth in line with your branding. For more information on our graphic design service or for a quote please call us on 01733 511030. Fast Dispatch – our printed table cloths are dispatched within 3-5 working days once we have received your artwork so you can have your table cloth quickly in time for your exhibition. At XL Displays we are experts in exhibition stands and portable display equipment. For more information on our branded table cloths, or any of our other exhibition products, please contact us or call us on 01733 511030.